Fastening metal pieces is a tedious task if you are a beginner and don’t have the right tools or equipment. From time to time, metal fastening comes in scene for which you have to look for the proper bonding tools. Usually, it is challenging to fasten two or more pieces of metal together without welding, soldering or bolting them. In that case, it becomes tedious to do the job right so to deal with that, special adhesive products are available in the market. The adhesives help attaching the metal properly and give good results almost similar like welding or bolting etc. To glue metal, there are three general types of glue i.e. cyanoacrylate, epoxy and polyurethane. All these adhesives are made of high quality ingredients and glue the metal pretty wonderfully. Also, these products make strong bonds if you follow the instructions right. To get the metal glue, you have to go to hardware, hobby and home improvement stores as they specialize in bonding adhesives at economical prices. The very first step before using the metal glue is preparing the surface. Careful preparation of the right metal surface is holds an important place to make sure the bond remains strong. To create metal bond, clean the surface using a sanding tool or scraping or paper towel etc. It is essential to remove dirt, dust, corrosion or rust in order to prep up the surface to take adhesive material properly. However, make sure there is no oil or wax gathered on the metal surface to be bonded. Dip a paper towel in a detergent or degreaser and clean the surface. Also, fine grit sandpaper can be used to roughen the metal surface so as to prepare it for gluing together as fine metal surface will not make the metal glue hold a good grip. Before you apply glue, pre fit the metal parts to see if there are gaps in between. Once the glue is applied, don’t touch the surface with your fingers or else it will stick to your hands given the fact that metal glue is very strong and powerful. Now once you are done with prep phase, it’s the time to apply adhesive as per the instructions. If you don’t follow what the manufacturer says, chances are likely that you get the metal bonded in a wrong way. 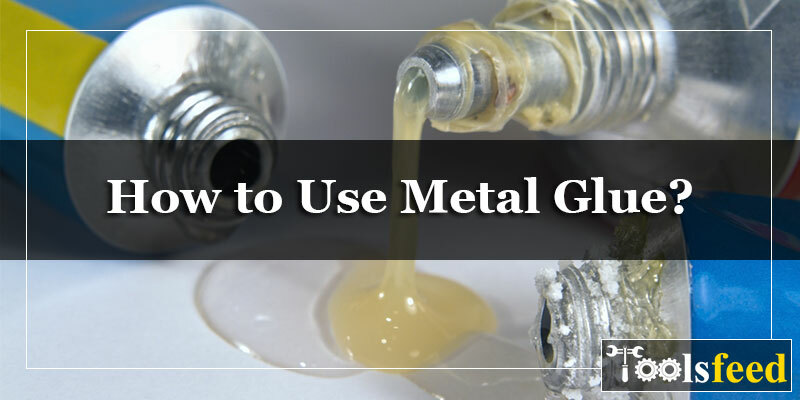 To get superb results, it is recommended to use metal glue in a ventilated area or outdoors because you are not supposed to breathe in the glue fumes as they can be harmful for your internal system due to the chemicals. Different types of metal glues are prevailing in the market among which epoxy tops the list. The epoxy glue creates the strongest metal to metal bond and is readily available at a local hardware or craft store. Epoxy glue demands you to mix equal parts of adhesive and hardener and then apply this mixture over the metal surface to be glued. Use an appropriate tool for the application and never use bare fingers for that. After applying the glue, assemble the parts immediately within two minutes to ensure the bond remains intact. The metal surface should be clamped together for the first 30 minutes and you should wait for at least 24 hours before using the glued item. Since the glue has a chemical phenomenon, the metal takes time to develop a stronger bond. Polyurethane glue is quite sticky and it glues the metal in a quite impressive manner. Since this is single part glue, it needs moisture to set but once cured, it is waterproof. When you apply the glue, make sure that both the metal pieces fit closely to fill the gaps, if any. Once the glue is applied, you need to clamp the parts together for 2 hours to prevent any bubbles to form and the pieces leave their hold. Last is the ethyl cyanocrylate glue which promises to deliver excellent results. It provides fast and strong metal bonds no matter what type of metal it is. But this glue don’t fill gaps so if two metal pieces have some space in between, it will be like that only so the surfaces that fit together perfectly are bonded with this glue. Also, this glue instantly glues the metal pieces in under a minute so you don’t have to wait for long. After applying the glue, leave it overnight and never touch it with your fingers or else your skin will be glued too. Now get rid of any debris around the surface you are gluing together. Sand it down thoroughly and avoid touching the glued surface with your hands. If you do that, your fingerprints or oils from your skin will sit on the surface. Now is the time to apply the glue on the metal surface once you are done with all the perquisites like preparation, choosing the right glue, and cleaning. Apply the glue in required quantity to get amazing results. If you wish to go for Epoxy, it is essential to mix two components i.e. adhesive and hardener and then use the glue on metal surface. If you want to use super glue, make sure to choose the metal pieces without gaps. As this glue offers an instant bond, an extra space can ruin the bond and once you have applied the glue, leave it overnight to get the strongest bond. Last is clamping of both the metal pieces together so that they get bonded. Either you can use your hands to hold them or choose another way to apply pressure after gluing. Follow the instructions on the glue packaging and give enough time to the metal pieces to form a bond. Whenever you work with glue, be very careful while applying. The glue should not spill on you or surroundings things nearby as it produces hazardous fumes. Make sure the space is well ventilated in order to keep everything sorted and good.